Virginia is home to 544 miles of the esteemed Appalachian Trial, more miles than any other state! Every year, hundreds of brave hikers, young and old, set out on the 80-year-old footpath in hopes of “thru-hiking” its 2,190 miles – often from Georgia to Maine. There’s often talk on the A.T. about iconic places and must-see spots that await in Virginia, like the sunrise at McAfee’s Knob and the wild ponies at Grayson Highlands State Park, or the famous Blue Ridge Parkway and scenic Skyline Drive. 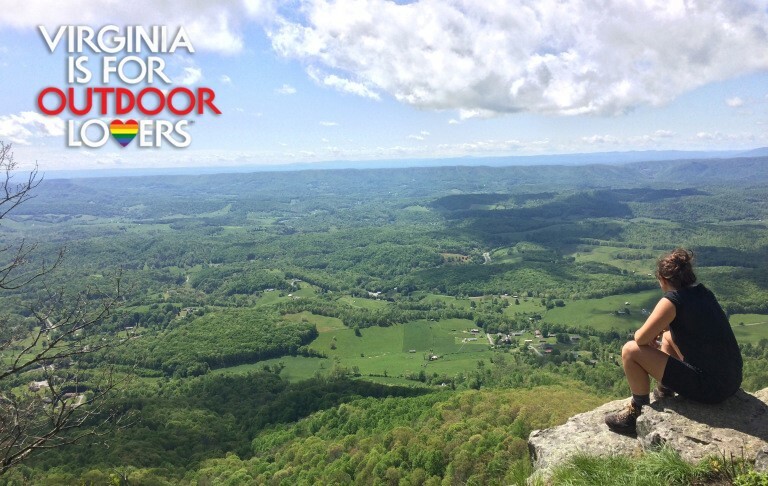 Virginia is also popular for weekend and section hikers, from novice to outdoor enthusiast, hoping to experience the trail’s endless beauty for a while. 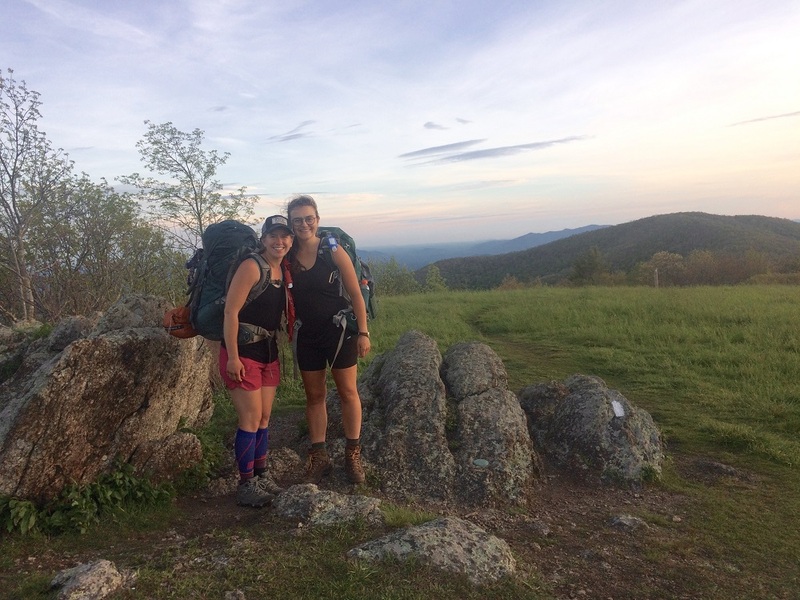 We asked couple Staige Davis and Andrea Parra, both thru-hikers on the trail, to share some of their experiences and insights by answering a few questions about their journey through Virginia this past June. How long have you been hiking? There are many answers to this question! We both started hiking when we were kids, thanks to schools, summer camps, and our families. I (Staige) remember my father taking my sisters and me on camping trips to places in Virginia like Bear Creek Lake State Park. I was hooked for life! As for this trip, specifically, we started at Springer Mountain in Georgia on March 5th. We hiked for about 460 miles through Georgia, North Carolina, and Tennessee, before crossing into Virginia at the end of April. Then we did more than 500 miles of hiking in Virginia! We go to West Virginia at the very beginning of June. The most important trip planning exercise was doing “practice” weekend backpacking trips as often as we could. We enjoyed weekend trips at Grayson Highlands State Park, the Three Ridges Wilderness, Cold Mountain, and McAfee Knob – all in Virginia! Aside from the practice hikes, extensive internet research and purchasing our gear carefully were key. 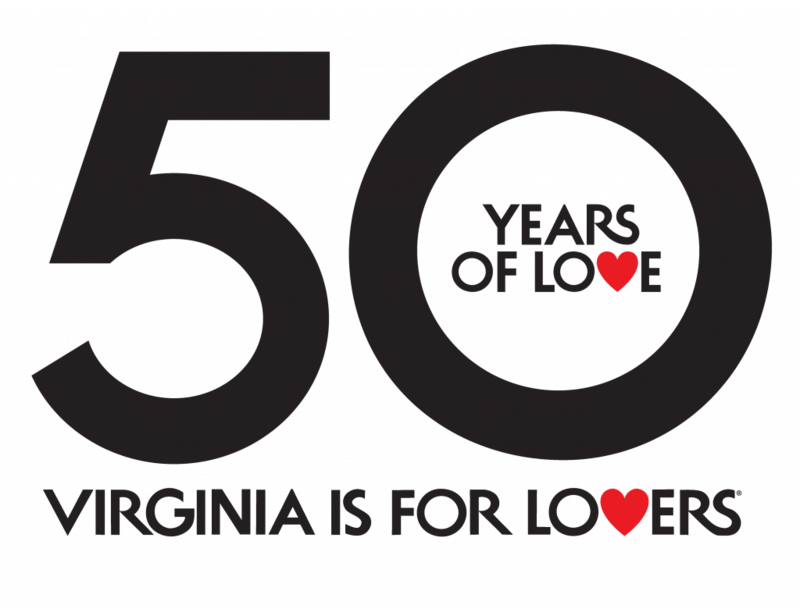 Were there any Virginia AT stops or places you were looking forward to visiting? So many! Damascus, VA marks the entrance to Virginia on the AT, so it’s a big milestone to get there. I (Staige) felt a big sense of accomplishment for having walked all the way to my home state. Another place we were really looking forward to was Devil’s Backbone Brewery in Nelson County. The food and drinks were amazing and they have a free campsite for thru hikers! What were some of your favorite, overall experiences? We had an absolute blast in Damascus, relaxing with friends from the trail and enjoying the hiker hospitality in town. We were especially glad to be in Damascus because it POURED rain while we were there, but we spent those nights warm and dry in a hostel! At Devil’s Backbone, we met up with several of our friends from Charlottesville, grabbed lunch from a trailside grill/gas station called Trent’s Grocery and spent a lovely evening swapping stories from the last few months during an impromptu 5-hour picnic next to the beautiful and ironically named Dismal Falls. We also enjoyed other stops along the way. We couldn’t pass up Skeeter Dogs in Wytheville, or coffee in Daleville coffee shop. We loved the wild ponies of Grayson Highlands, the Dragon’s Tooth monolith, McAfee Knob, and the Tinker Cliffs. But we’ve also had long stretches of not much to see, rocky trails (my personal nemesis), and relatively cold, wet weather. A few times I’ve wondered if I was getting a touch of the infamous “Virginia Blues.” I’ve been plagued by very sore feet, but a new stretching routines, new boots, and new “compression socks” sent down from my family are helping a good deal. Every time I’ve felt down- a little bored or too tired to hike on, someone else in the incredible community out here has picked me up. I’m lucky to have Andrea as a hiking partner and our friends on the trail. Even the friendly shuttle drivers and shopkeepers in trail towns have a way of reminding me what a treat it is to be out here. We went through several trail towns. As I mentioned, Damascus is a perennial hiker favorite, and it’s hard not to have a good time in such a hiker-friendly place. But there are other great towns that are not quite as well-known. For example, we really enjoyed Buena Vista, which had a retro budget motel, an Italian restaurant with hiker-sized portions, a hiker-friendly library on Main Street, and an Amish grocery for exciting resupply options. We had a great trail magic moment on Mother’s Day when we were hiking along the Blue Ridge Parkway. A local woman brought an amazing spread of sandwiches, pastries, chips, fresh fruit, and drinks to a place where the trail crossed the Parkway. She kept saying, “Call you mothers and let them know that there’s another mother out here taking care of you!” It was so sweet. What were some of your favorite moments from the Virginia AT? There are too many to list them all! I really enjoyed spending our quiet morning break by the Keffer Oak Tree, the second-largest tree on the trail, which is more than 300 years old. The tree is nestled in beautiful rolling farmland, and it was fun to imagine the history of the people who lived there. What surprised you about the Virginia AT trail? It’s not easy! You’ll hear some AT thru-hikers say, “Virginia is flat.” I’m not sure where they’re hiking, but the trail we took was rugged! What advice would you give hikers of the Virginia AT? If you’re just starting out as a hiker, start small and build your way up to bigger hikes. Also, there’s no shame in waiting to go in good weather. Even for the most experienced thru-hikers, bad weather can really dampen your mood. For more experienced hikers, figure out a way to learn to love big climbs. Everyone’s different so experiment with hiking with a friend, listening to music or audiobooks, taking breaks and practice mindfulness. The top of a mountain feels even better if you enjoy yourself on the way there! What Virginia adventure would you like to tackle next? We’ve been dreaming of a road trip! Andrea loves driving down windy, scenic backroads, and I love exploring tucked-away small towns. Virginia has both of those in scores! 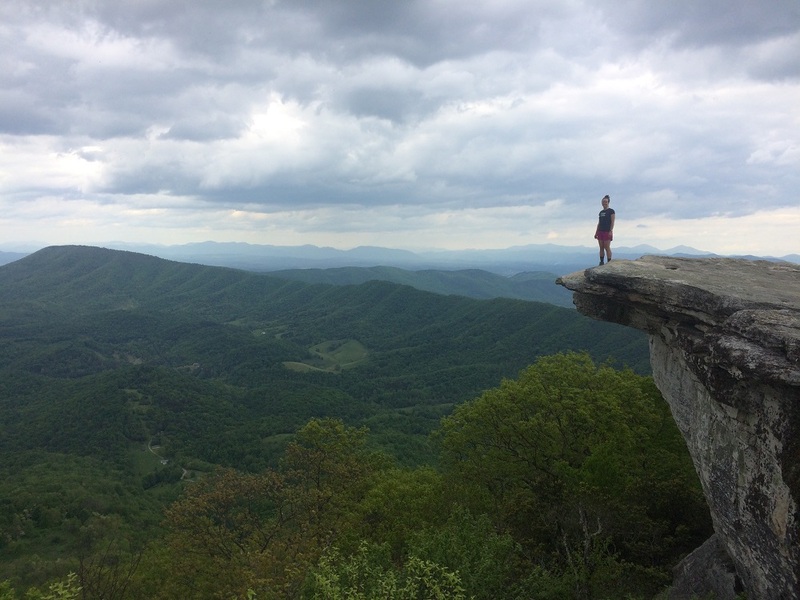 Staige Davis is an outdoor enthusiast who also enjoys yoga, reading, and indulging in Virginia’s local food scene. She calls both Richmond and Charlottesville, Virginia home. Andrea Parra is a native of Bogotá, Colombia who moved to Virginia to attend UVA. In addition to backpacking, she spends her weekends rock climbing and whitewater kayaking.